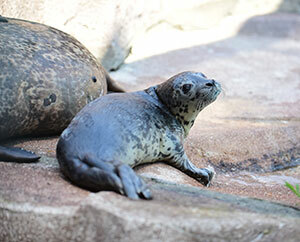 Zoo Welcomes Seal Pup, Triton! The Milwaukee County Zoo is pleased to announce the birth of male harbor seal pup, Triton, on June 13 to mom, Sydney, and dad, Ringo. The pair’s third pup, Triton is part of the Species Survival Plan® (SSP), which helps to maintain genetic diversity within captive seal populations. Zookeepers report that Triton was quite vocal with mom right from the start, and the Zoo’s two yearlings, Cossette and Siku, have recently been taking turns socializing with him. Nearly 30 pounds at birth, Triton’s weight reached almost 70 pounds while nursing. Now that he’s in the weaning stage, his weight is down to about 60 pounds. The seal pup’s diet will consist of capelin and herring. According to zookeepers, Triton displayed an immediate interest in mashing fish in his mouth, and has since moved on to eating small pieces of fish. For enrichment, Triton enjoys a kiddie pool, sprinklers, fish-cicles (think Popsicles® but with frozen fish treats), balls and other floating or sinking items to manipulate and investigate, and listening to music and nature sounds. He will begin a training program once he’s eating fish regularly. Triton’s zookeepers report that he is calm around them and seems very comfortable with being touched, which may be related in part to Sydney’s experience as a third-time mom. In recent years, there have been unusual mortality events (UME’s) on the West Coast that have caused thousands of seal and sea lion pups to become stranded and in need of rehabilitation. Stranding centers that help these pups are always in need of support. Check out the Marine Mammal Center to find out how you can help support this cause. Stop by the Harbor Seal Exhibit to learn more about harbor seals during our Animals in Action talk, daily through September 5 at 3 p.m., and come meet Triton today!